Spirit Double Walled Acrylic Tumblers - 16 oz. The Spirit Acrylic Double Walled Tumbler with a straw and your custom logo. Want one of the most popular mugs of the decade? Want oogles of colors to choose from? Want a great price! Then here it is. The 16 oz acrylic double wall tumbler with threaded lid and matching straw. RUSH AVAILABLE! Even comes in awareness pink. A great promotional acrylic tumbler. Available Colors: Clear, Blue, Apple Green, Purple, Graphite, Tangerine, Red, Aqua Blue, Green, Pineapple Yellow and Fuschia. 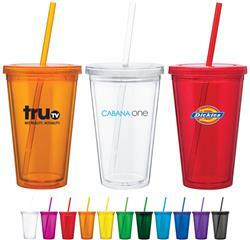 Typical Imprint Area(s): 3" x 3-1/4" x 9"
Double Walled Acrylic, Straw, Twist on Lid, 16 oz. 13 pounds per 24 pieces plus box charge.